By now, most people know what Twitter is, and probably how to use it. Advanced Twitter tips, who needs ’em? Well, Twitter is a much more powerful tool in the hands of people that really know how to harness that power! Being a social media marketer I can whiz through Twitter and bend it to my will 😉 … and leave people wondering how I did something or found something so fast, or so easily. 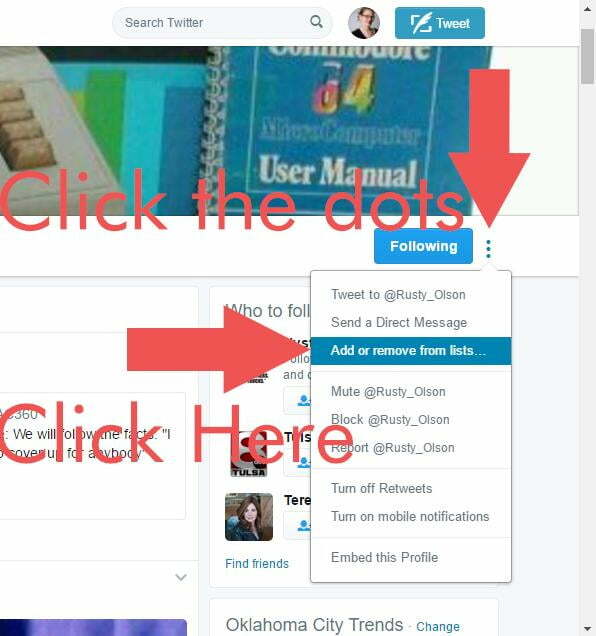 Today I want to share these advanced Twitter tips with my friends at RocksDigital. So without further ado, here are 3 advanced social media tips for Twitter to help you get more out of the platform! 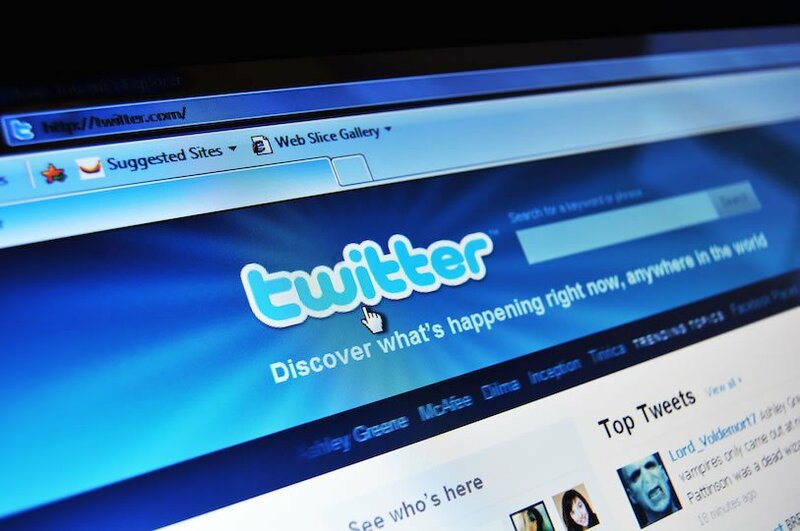 If you’re a Twitter user, you have most likely used a Twitter search before. You may have even saved the searches for use later. But what I’m about to share with you will help you find just what you’re looking for with the click of a few buttons and a saved search. Did you know that search engines (like Google, etc.) have what are called Boolean search commands? These strings of words and symbols help the search engine determine, in a much more refined way, what you are looking for. Let’s say you are looking for opportunities to be a podcast guest in your niche. Twitter has it’s own search engine. So fire up Twitter! People are looking to connect with others on Twitter every day, so why not use it as a tool to help yourself? Below is an example of an advanced Twitter search where users are tweeting about looking for guests for their podcast. 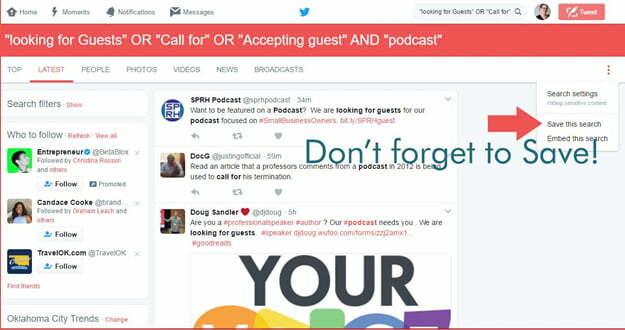 This string tells Twitter you are looking for tweets that have the phrase “looking for” or “guest wanted” or “want to be a guest” as well as the word podcast. Go to your “Latest” tab on your search to find the tweeps tweeting tweets just like that. 🙂 Fine-tune the search, then save it to use again and again later on. 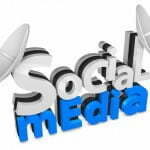 If you use Twitter on a regular basis, you might make some connections with businesses or other people who could potentially become customers. (That’s actually how I got started with my business!) When you begin these conversations or when someone comes to you with interest, after answering their questions, do you keep up with them? Sometimes, it takes a little warming up before a conversation can become a sale, so how can we nurture that along? The answer is Lists. Go to the profile for the account you want to add to your new list, and click the three dots next to the “follow” or “following” button, as shown below. 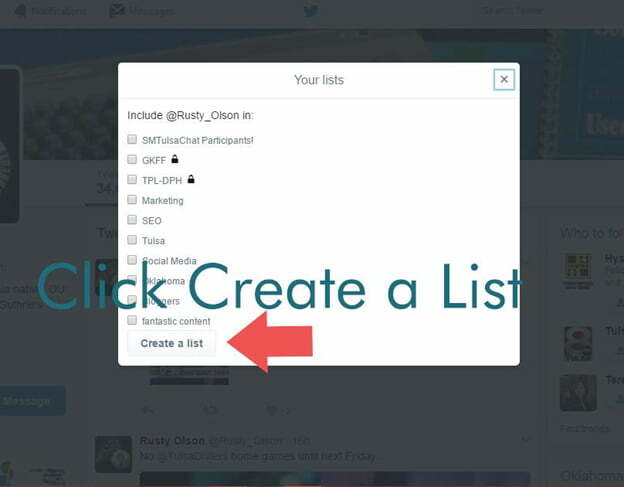 Click “Add or remove from lists…” and then click the checkbox next to the list you want to add the user to, or click “Create a list” to create a new list. 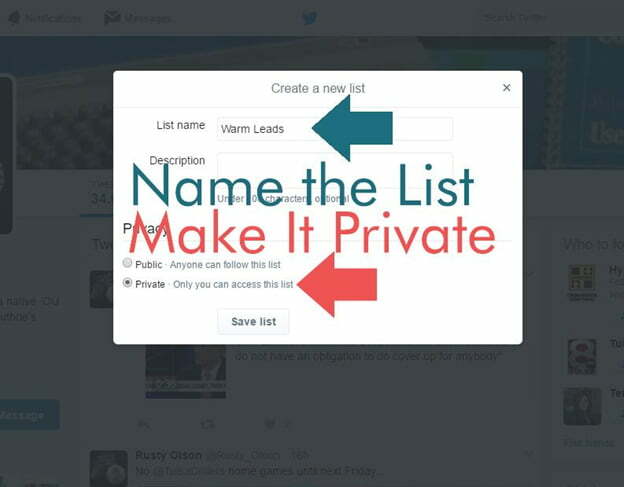 If you’re creating a new list, be sure to give it a name and then make it a private list, so people don’t know they are on this list, and no one else (like a competitor!) can view it. This list will allow you to keep up with those users in one place without having to go to each profile and remember which users you were talking to. This way, you can help promote them when you’re able, jump into relevant conversations, or answer questions as you see them, becoming a trusted resource for them. When you earn their trust and become a familiar face, they are going to be much more likely to buy from you or use your services. As a business owner, one of the easiest (and most dangerous) things to do is to schedule content ahead of time. (I say dangerous because if you just set it and forget it, you’re in for some wasted time and effort.) However, with many of the most popular tools for scheduling, links may get shortened, causing no preview, or images or other media may not show up. Since tweets with photos get up to 313% more interaction, it’s important! TweetDeck is a tool that originally came out years ago, and people loved it. I loved it! But then Twitter acquired it, and effectively ruined it. However, more recently they’ve made some updates to it, and now, a big pro to using it will be that we can schedule tweets, and media will show up natively in the platform – because Twitter owns it! The best part? This includes GIFs! 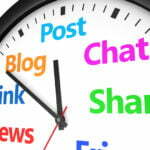 So if you’re looking for a tool to help supplement your scheduled social media content without causing problems, I would go ahead and check it out, even if you only use the web version. Did these advanced Twitter tips inspire you to see Twitter with new eyes? Have questions on how to get going? Share your thoughts in the comments!